The SureFire R1 Lawman is a rechargeable high-powered LED flashlight designed for law enforcement use and features a maximum output of 750 lumens triggered by user programmable head and tailcap switches. The R1 is capable of providing up to 5 different modes of operation including momentary high output; constant-on high, medium, and low outputs; and a high intensity strobe. Normally powered by a proprietary lithium-ion battery, the R1 is “Dual-Fuel” capable and may also be powered by two primary or rechargeable 123A cells using the included battery carrier. When powered by 123A primary cells, maximum output is limited to 500 lumens and runtimes are reduced by approximately 25%. MSRP for the R1 is $455 with actual retail pricing below $350. The R1 Lawman arrives in a sturdy retail box with the light neatly stored in a foam cut-out and all accessories packaged in an inner cardboard box. The Lawman comes with everything needed for operation right out of the box, including a wall (AC) charger with international adapters, car (DC) charger, rechargeable lithium-ion battery, carrier for 123A batteries (2 primary 123A cells included), rubber anti-roll ring and User’s Manual. The light itself is constructed of aerospace aluminum with a hard anodized black finish. Measuring 8.1” long and weighing in at 10.2 ounces, the R1 Lawman has a solid feel in the hand and is well balanced. The body of the R1 measures approximately 1.07” in diameter and is knurled for improved grip. Other styling details such as the slightly flared tailcap and machined flats on the body enable a secure hold on the light. The laser engraving is all very sharp and stands out against the matte black finish of the light. One reason for the added length of the R1 is the built-in charging circuitry which eliminates the need to remove the battery or place the light in a cradle for charging. The charge port is open and does not have a rubber plug or cover but is designed to be weather resistant. The battery is recharged by plugging either of the included chargers into the side port. The LED indicator will turn red to indicate the light is charging and then turn green once the battery is 90% charged. The battery charges fairly rapidly up to 90%, never taking any longer than 2.5 hours in my tests. Green – Battery is fully charged and/or capable of sustaining the current level of output. Changing the output mode may change the status of the indicator light. For example, while the indicator may be amber in high mode, dropping down to medium mode will cause the indicator to turn green if the battery can sustain that level of output. Although the User’s Manual states the light may be left plugged into the charger without damaging the battery, a separate note was also included in the paperwork. It appears that the charger may shut itself off after 10 hours of operation and could then begin to drain the battery very slowly. The lithium-ion battery and 123A battery carrier may be swapped by removing the tailcap and then pulling on the U-shaped tab at the rear of the battery or battery carrier. For installation the steps are simply reversed and the U-shaped tab can be used to rotate the battery or battery carrier to align the electrical contacts with those in the flashlight. The contacts are shaped so that the battery will not fully seat unless they are positioned correctly. The lithium-ion battery and 123A battery carrier each measure approximately 106mm long and are just over 20mm in diameter. The lithium-ion battery has a rated capacity of 10.4Wh (2900 mAh at 3.6 volts). The aluminum tailcap of the R1 Lawman houses a press for momentary, rotate for constant-on tactical switch and features prominent ridges around its circumference which help with rotating the switch. The tailcap switch can be “locked out” by loosening it just over ¾ of a turn but the head switch will still function. In fact, the tailcap is not even needed for operation as the head switch can still control the light, even with the tailcap completely removed. The rubber switch boot protrudes approximately 3/16” beyond the edge of the tailcap. The separate electronic head switch can also be used to turn the light on and off and, depending upon how it is programmed, may allow the user to select different output levels. The switch has a hard rubber cover molded with the SureFire logo and provides a tactile “click” when operated. Machined flats on the side of the head help prevent the R1 from rolling away when laid on a flat surface. When even more stability is required, the included rubber anti-roll ring can be installed by slipping it over the crenellated bezel. 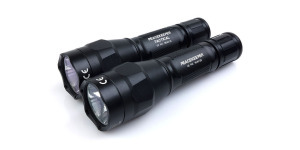 The bezel measures 1.62” in diameter which is the same as several previous SureFire incandescent lights such as the M3 CombatLight, 9AN Commander and some weapon lights. As a result, the R1 Lawman can use many of the same attachments as these earlier lights, including the FM14 BeamShaper (diffuser), FM15 Red Filter, FM16 Blue Filter, and FM17 cover. Users may select from one of three programs which dictate how the R1 Lawman will operate. With Program 1 and Program 2, turning the R1 on with the head switch will activate the last mode used with the other modes accessed by additional presses of the button. After the light has been on and in one mode for longer than one second, pressing the head switch will turn the light off. There is no momentary output function available from the head switch. Regardless of which program is chosen, the tailcap switch will always function as a press for momentary, twist for constant-on tactical switch and will trigger the maximum output, even if the light was already turned on in a lower mode using the head switch. If the light has already been turned on using the head switch, it will shut off once the momentary switch has been released. When using Program 3, the strobe function may be used in momentary mode by pressing the tailcap three times quickly and holding after the third press. Once activated it may be changed to constant-on mode by tightening the tailcap. Alternatively, constant-on strobe can be achieved by twisting the tailcap off/on three times and leaving it tightened the last time. To change from one program to the next, the tailcap is tightened to constant-on (or the momentary switch is held on) and the head switch is pressed and held for just over 6 seconds until the R1 turns off. 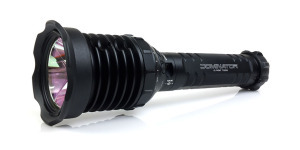 The business end of the R1 Lawman features the Cree XM-L emitter coupled with a lightly textured reflector which produces a beam with a prominent center hotspot and considerable amount of spill. Overall the beam has a very slight cool tint with a small amount of yellow or green tint visible in the corona around the hot spot. Although this is noticeable when illuminating a nearby wall, it is not very noticeable in actual use. The following slides show the R1 Lawman compared to a variety of other lights to give some perspective with regard to output and beam profile. The images can be compared across their full widths using the slider and additional comparisons can be viewed by using the navigation buttons in the bottom-right corner of each image. Runtime tests were conducted using the provided Lithium-Ion rechargeable battery and 123A primary cells. When powered by the lithium-ion rechargeable battery, the R1 Lawman steps down to 70% of its initial output after about 2 minutes of runtime. It then maintains this level for just over 40 minutes before beginning a long decline in output as the battery becomes depleted. The head of the R1 begins to heat quickly when operated continuously but with the step-down in output it never gets particularly hot. 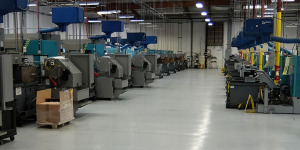 Two primary 123A batteries powered the light at a reduced level of output that began a steady decline after approximately 10 minutes of runtime. In the 150 lumen medium mode, the lithium-ion rechargeable battery provides over 4.5 hours of steady regulated output before dropping out of regulation and beginning to decline. With both battery types the R1 provides a nice long tapering output as the battery becomes depleted, giving the user advance notice of the need to charge/change batteries or switch to a back-up light. According to the paperwork included with the R1 Lawman, it can be operated with rechargeable Lithium Phosphate RCR123A cells but I received some erratic results when testing with this battery type. Once I have these issues resolved I will update the review with those results as well. 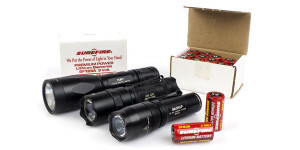 All things considered, I’m glad to see SureFire back in the rechargeable light business. Owing to advances in battery and LED technology, today’s rechargeable lights are nothing at all like their predecessors. 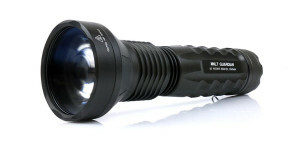 The SureFire R1 Lawman is a fine light. Upon first opening box and handling the R1 it is obvious that it is cut from a different cloth than some of the other recent offerings from SureFire. This is no slight against lights such as the 6PX and P2X Fury but the R1 Lawman is in a completely different class with regard to fit, finish and apparent quality. The machining appears perfect and the plentiful knurling is a welcome sight, not just for aesthetic reasons but for the terrific grip it provides. This is further enhanced by the length and even the slightly larger diameter of the body which combine to make the R1 easy to hold in a variety of positions. I was somewhat surprised to discover that the light is even comfortable to hold in a cigar grip. The lithium-ion rechargeable battery provides respectable runtime in high mode and solid performance in medium. Although some may take issue with the fact that the light does not maintain regulation in high mode for more than 45 minutes, I would estimate it produces 300+ lumens for nearly 90 minutes and I appreciate the long tapering output as the battery is depleted. The charging system has worked without issue. The head and tail switches have worked well together and operation is more intuitive than I expected. I prefer the default program (no strobe) and generally have left the head switch in medium or low mode with full output available at any time from the tailcap. At 15, 150 and 750 lumens the three output levels are well spaced and provide good options with regard to output and runtime. Although it is easy to use, some sort of tactile landmark in line with the switch would be useful for orienting the light properly in the hand. There were complaints of some early models having stiff tailcap switches but the one I tested was easy to use and required only the slightest pressure to activate. One disappointment with the R1 has been the limited carry options. From the time the light was first announced, SureFire literature has shown the Lawman as being compatible with the V86 and V87 leather holsters but the R1 was been out for nearly two years and neither of these holsters are available yet. As a result, many owners have “made do” with holsters designed for other lights. It goes without saying that the high price of the R1 Lawman is another important consideration and the $455 MSRP is enough to give anyone sticker shock. However, with retail prices running closer to $320 it’s not quite as bad as it first seems. As with anything else, it is always a matter of cost versus benefit and if the R1 Lawman provides the output, runtime, and programmability that you need, I know of no other rechargeable duty light that will also provide them, regardless of cost. Still no holster availability from SureFire. For a duty light with a protruding tailcap switch this seems like a significant issue. The lack of “ready spare” batteries and standalone charger may be a problem for those who use their light for very long periods of time. With SureFire not providing any carry options for the R1 Lawman, the good folks at Multi Holsters have helped fill the gap with their own Kydex holster for the R1 Lawman (see review). Share your thoughts, questions, or experiences with the R1 Lawman in the comment section below. 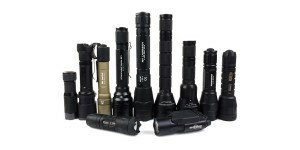 Additional information about the R1 Lawman can be found on the SureFire website. I just wanted to let you know, that i appreciate the review, especially the comparison shots. It was a big help, when choosing the R1 as my next duty light. Thanks for taking the time to post! Regarding the holsters, Tony from Multiholsters.com makes a custom kydex sheath with a Tek-Lok mount, thats great for patrol duty. It has a closed bottom, so accidental activation of the tailcap is not possible. No need to send the light in. No affiliation, just wanted to spread the word, as the R1 is missing a good holster. Thanks for mentioning the Lawman holster from Multiholsters. I will have to see if I can review one of them soon. This means one cannot have the light run in medium mode for general observation in ready to use firearm position, then hit the rear botton to blind the suspect while pulling ones firearm unless being left in the dark once the rear botton is released. Who designs this “duty light” to not return to selected-by-head-switch-output-mode after the rear button is released?!? I still have my firearm in hand and cannot start regripping the flashlight I operated with my thumb to hit the front button to turn items on again! The R1 Lawman tailcap switch follows the same “tactically correct design” (SureFire’s description) as previous SureFire tactical lights. The doctrine follows that when the light is used in momentary mode, it needs to go dark whenever the switch is released to allow the user to control the situation. In many cases it would be detrimental to have the light return to the lowest output mode (if that was what was used previously) which is only bright enough to highlight the user’s position and could create a tactical disadvantage. This doesn’t mean it’s the perfect solution for everyone but it at least has some thought behind it. In the scenario you described, you would probably be better off twisting the tailcap and activating the constant-on full output mode if you will be unable to hold the momentary switch depressed. Alternatively, it is relatively easy to replace the stock switch mechanism with a “click-type” switch. Thank you very much for explaining me Surefire’s “tactically correct design”. I had assumed that this is only the case for R1 Lawman, but not for Surefire’s other lights. Unfortunatally the R1 Lawman got interesting again, because of it. May I ask, if you’re at some point also going to review UBR Invictus to complete the circle of Surefire’s rechargeable flashlights? Thank you for providing a possible solution for that scenario. And also for your information about the different switches. What I need to add is that you apparently have a pretty good sense, which flashlights is worth to be reviewed. I’ve never felt my time wasted after reading your reviews, but have been finding very usefull information instead. Also unlike the other gentlemen out there reviewing flashlights you do not not recommend flashlights, that suffer bad build quality. I’m glad it helped and I appreciate your kind words. I don’t own the UBR Invictus but perhaps someday I will be able to get one and do a review. It appears to be a hybrid of the UB3T Invictus (which I own) and the UNR Commander (which I also own) so it should perform quite nicely.